Well, Mallory and I have read another book – this time a story I remember reading (and loving) when I was about Mal’s age. I stumbled across Jane-Emily when I was ‘shopping’ at Book Closeouts and couldn’t resist. It’s a story about a little girl, Jane, who goes to visit her paternal grandmother after her parents are killed in a buggy accident. She’s accompanied by her 18 year old aunt, Louisa. Her grandmother is kind but stern. She’s had some tragedies in her life – the recent loss of Jane’s father, of course, but also the death of her beloved husband and young daughter, Emily. Emily appears to have some unfinished business at the house. I remember this book as being really creepy, but let’s face it, that was 35 years ago. I wonder how it compares to some of the books Mal’s read. What did you think, Mallory, did you find Jane-Emily scary? Mallory: No. Not at all. It wasn’t scary, but I loved the way the story took place in 1912. I love books that take place in the past. What about you? Christie: Well, I have to agree with you, Mal. Not scary at all. In fact, I have to admit to finding the book a little slow-moving. It’s just a novella, only 140 pages, but it moved fairly slowly. I think I remember it as being slightly more action-packed. I did like how atmospheric it was, though. Do you know what I mean by that? Mallory: Umm… I think you might be talking about the feeling each day brought as it passed in the book. If I’m right, then yes, I did. I liked the way each moment seemed a little care-free or relaxed. It is summer vacation, remember. Christie: You’re close. Atmosphere is the way the story makes you feel…so, for example, Clapp took her time making you feel the heat of each summer day – when it was hot, you knew it was. Remember how they were always going to sit in the shade of the tulip tree? And when they went up into the attic, there was this sense of foreboding, like they might discover something awful and they did – remember? Mallory: Yeah, I do remember what poor little Jane found. That wax doll with the melted face. Emily sure seemed like a nice little girl, right? Christie: Well, I guess that’s the difference of 35 years. This isn’t a splashy book. There wasn’t any violence or anything graphic, but as a ghost story I think it was okay. How does it compare with other creepy stories you’ve read? Mallory: I think the romance in this book overshadowed any ‘creepy’ parts. As for a comparison- the book The Enchanted Attic by M.D Spenser forced me to read it only in daylight. Literally. And truthfully, (and I’ll only admit to doing this once) I read nearly all of Jane-Emily at night with a little reading light. I didn’t even shiver. Mallory: I’m going to deny anything you accuse me of. ;). 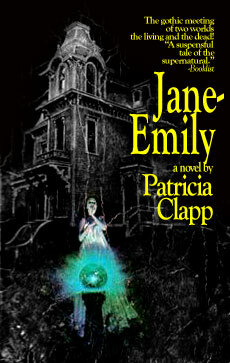 I recommend Jane-Emily to to readers who can’t handle a huge scare- and who prefer more ‘mild’ creepy books. But I must say, this novella paints a gorgeous picture of summertime in your head. And I think every ludic reader loves a book that does that! This entry was posted in Uncategorized and tagged 2010, Mother/Daughter Reviews, teen by Christie. Bookmark the permalink.